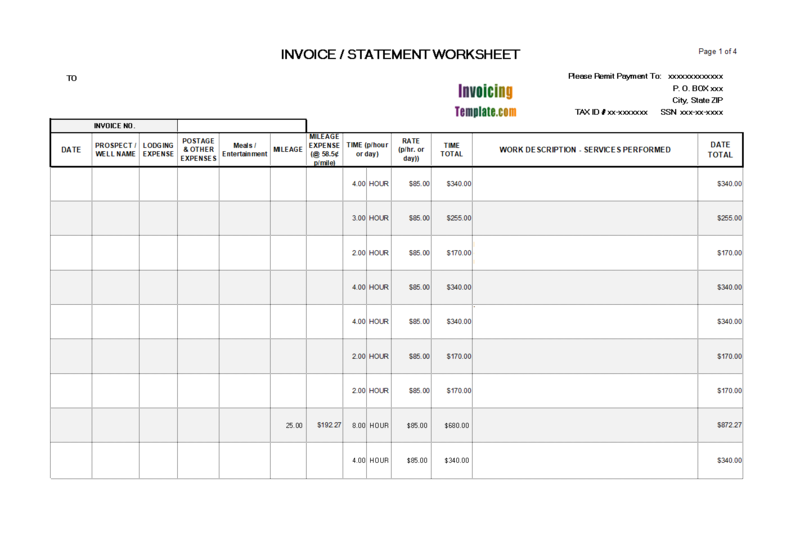 Free Invoice Template Microsoft Works is a sub-topic of Invoicing Format For Office . 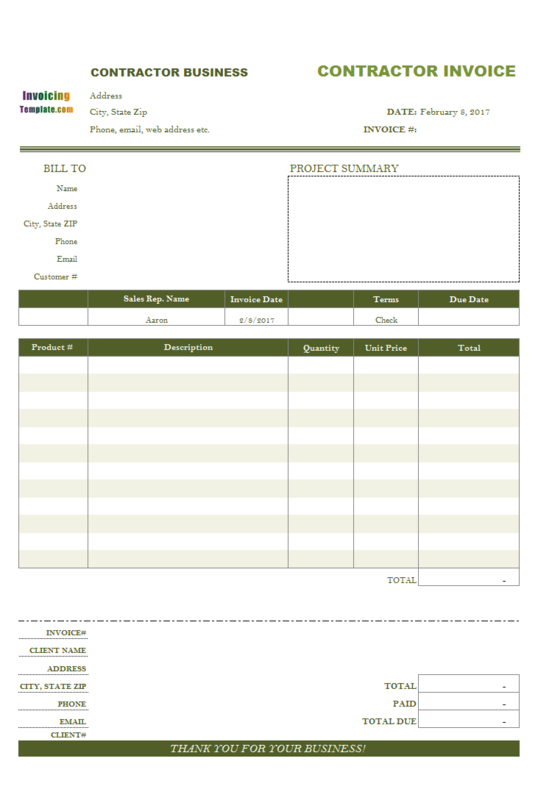 Here are our templates closely related to Free Invoice Template Microsoft Works. 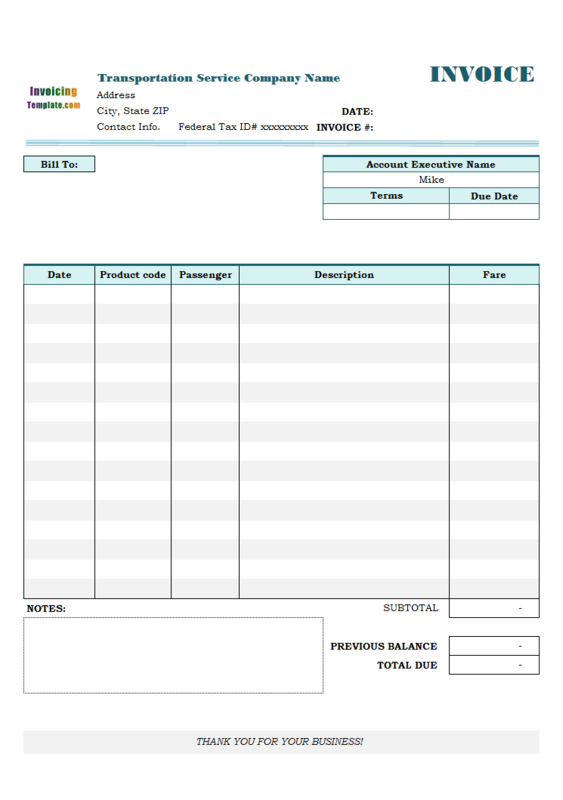 The template has no tax set by default (the tax cells are hidden and not printable). With Invoice Manager for Excel (namely Uniform Invoice Software) installed, you can easily change it to one tax or two taxes, depending on your particular needs. Simply click the Settings button on the ribbon tab, and then go to the Taxes tab, choose your tax type (no tax, one tax, two taxes), enter the tax name such as VAT, and the rate, click Apply and you are done! With this flexibility, we can say this template is not only suitable for freelancer, limited company and also sole trader, whether they are VAT-registered or not. 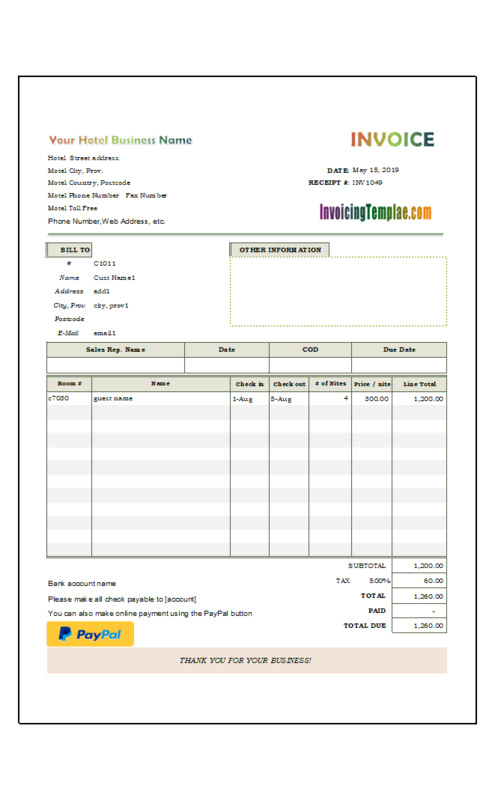 To getting paid on time for your freelance writing / designing / editing / journalist / website developing / consulting / video production / translation work the best way is to send an invoice, by traditional postal mail or electronical email, in either PDF format, Excel spreadsheet (xlsx / xls) format, or even image format. 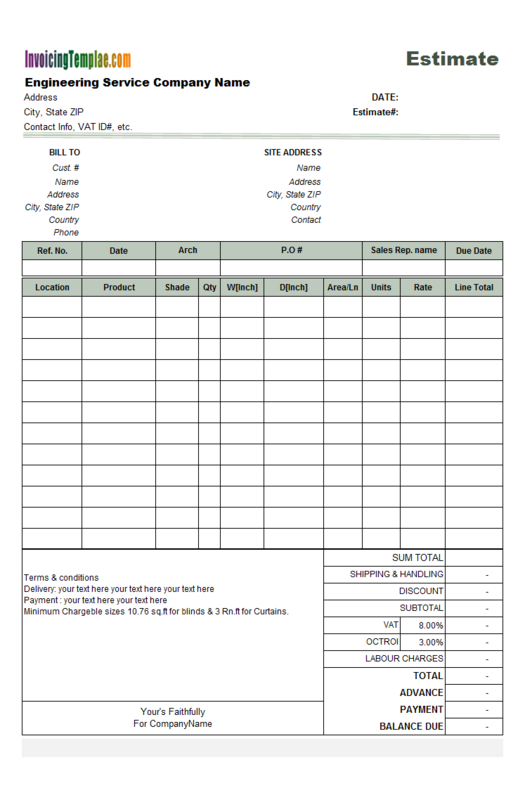 This shipping packing slip template is designed for small business that sells and ships goods. 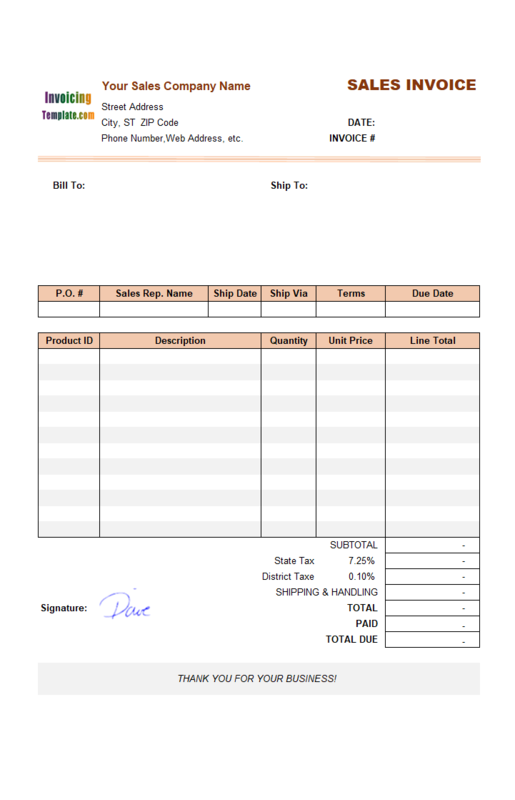 Unlike our previous designs of pack list templates for shipping goods, this template implement the packing slip form in a separate form but within the same Excel template as the invoice form. 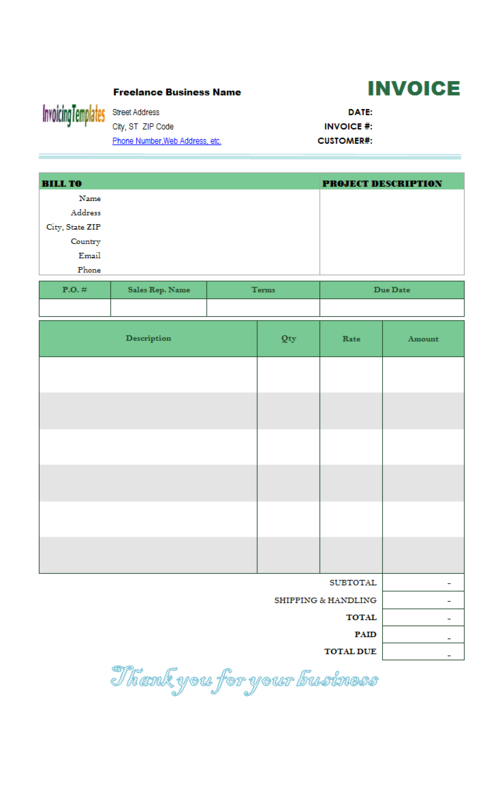 It's well known that Microsoft Excel provides powerful features for formatting and presenting data, and that is why so many invoice templates are provided in Excel format. However you may not notice that Excel also provides handy tools to define or build the relationship between cells or fields. 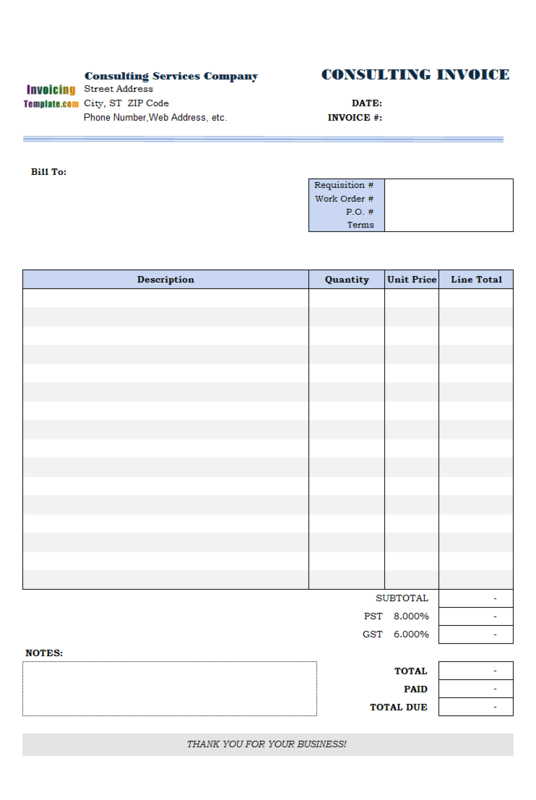 Now let's take a look at this template c2024 Website Development Invoicing Sample (also named Website Development Billing Format) itself. As stated early, this template was created based on c4029. 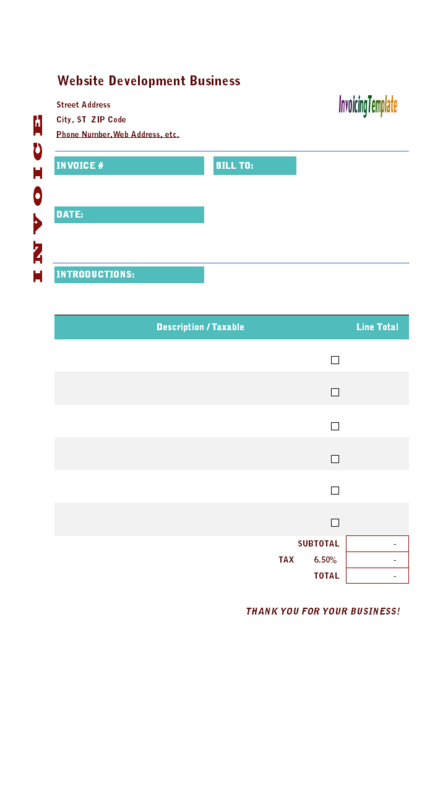 On designing this template, we moved the two existing columns, Quantity and Unit Price (or Hours and Hourly Rate) out of the printable form. 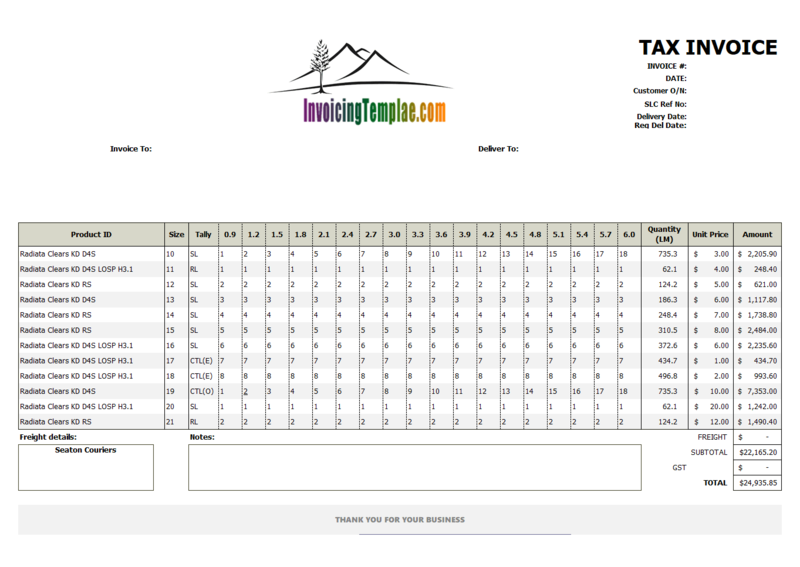 Also, we removed the formulas of the Line totals cells so that it accept values that are manually filled in. 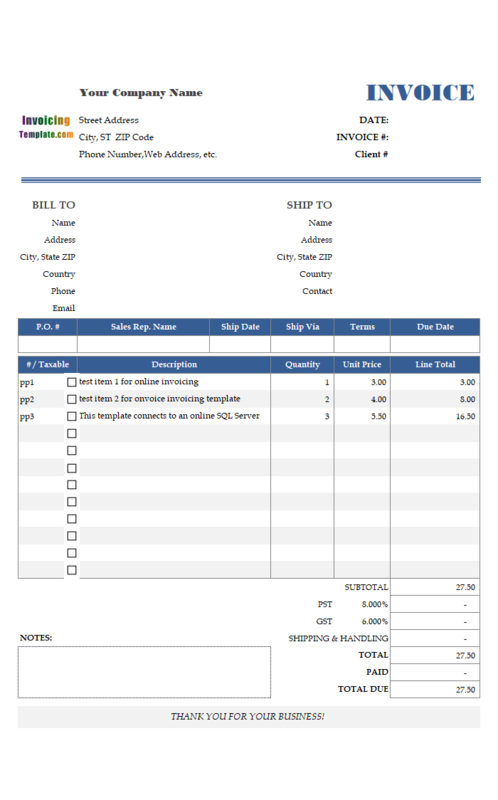 This transportation bill sample / invoice template in Excel ".xlsx" format helps you prepare transportation invoice, trucking invoice, carrier invoice and shipping invoice. It also could be used by taxi / limousine service business. 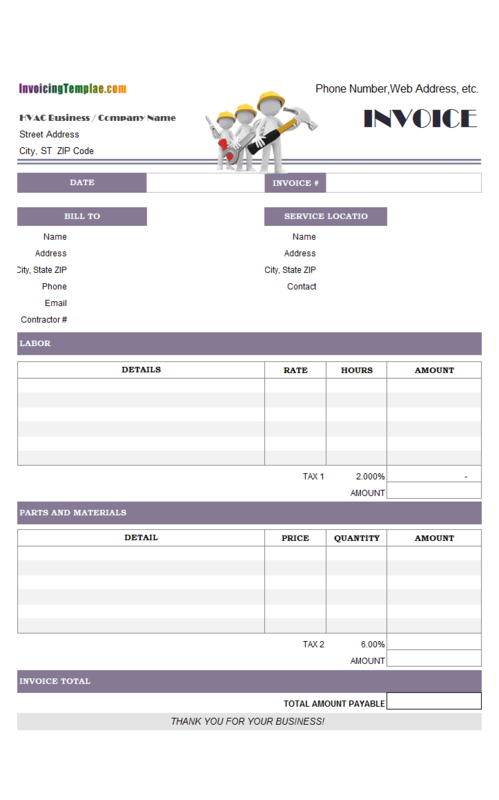 This invoice template designed for musician includes a stave background image. 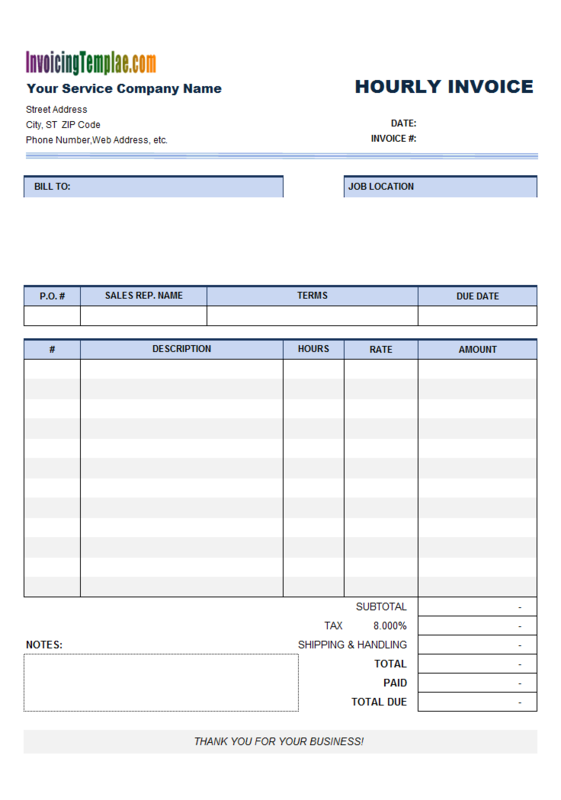 Besides the Excel spreadsheet template, a PDF billing format template for musician is also included. 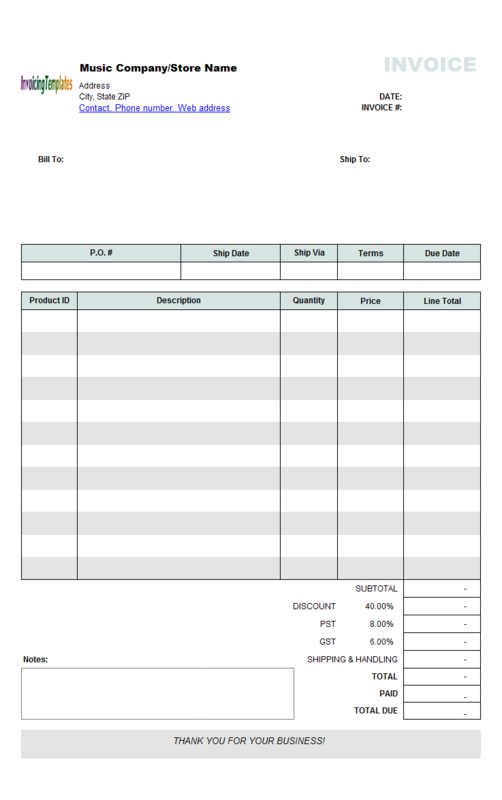 This sample is formatted with Australian currency but you can easily change it with Excel formatting tools. 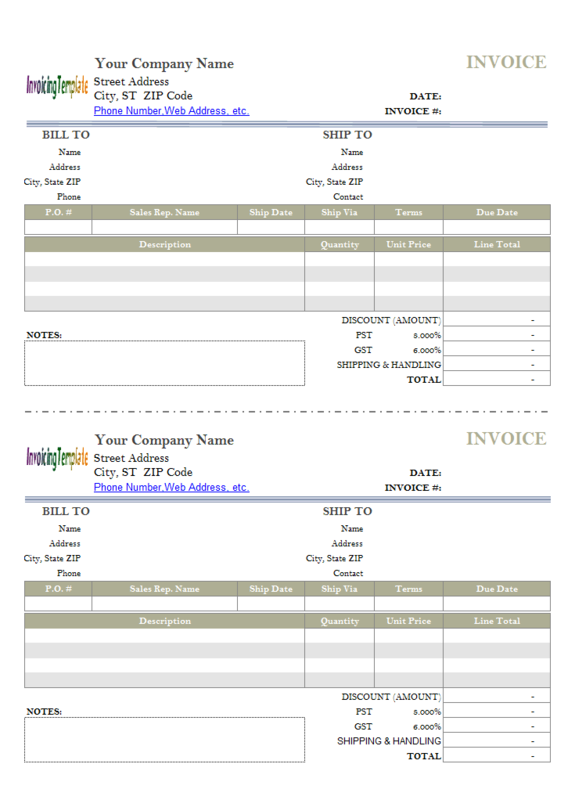 Each template here on InvoicingTemplate.com comes with the corresponding PDF version, visit Adobe PDF invoice templates for more information. Prepare a folder for storing your PDF files. Say "C:\MyPdfInvoices". 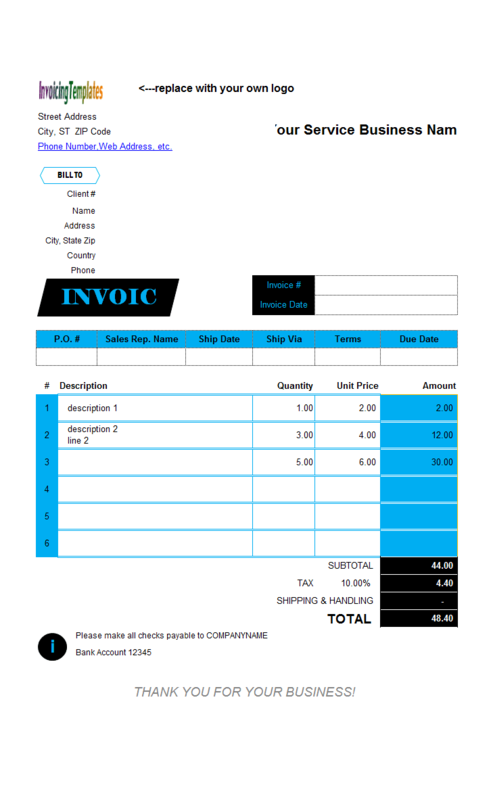 Enter this folder information on the invoice template, cell $T$6 with blue background. Make sure the folder name is ended with a "\" symbol. For example, if you store your pdf files in the folder C:\MyPdfInvoices, then enter "C:\MyPdfInvoices\" in cell $T$6. 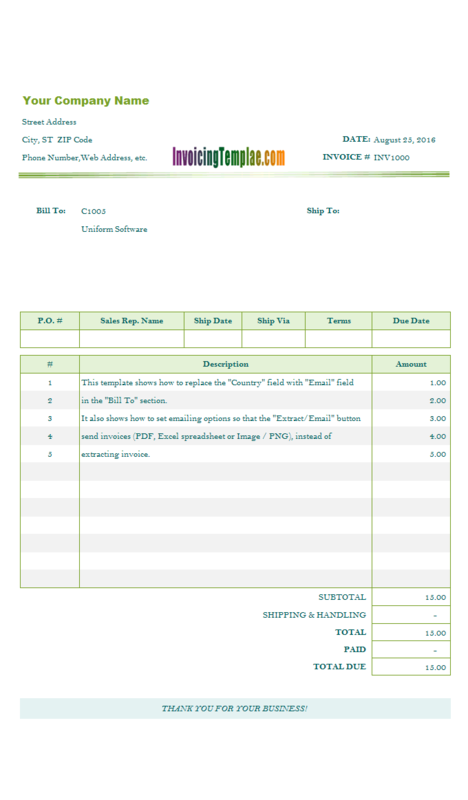 Save your invoice template by clicking Excel menu File -> Save. You need to do this (specifying the folder where you store you PDF files) only once. 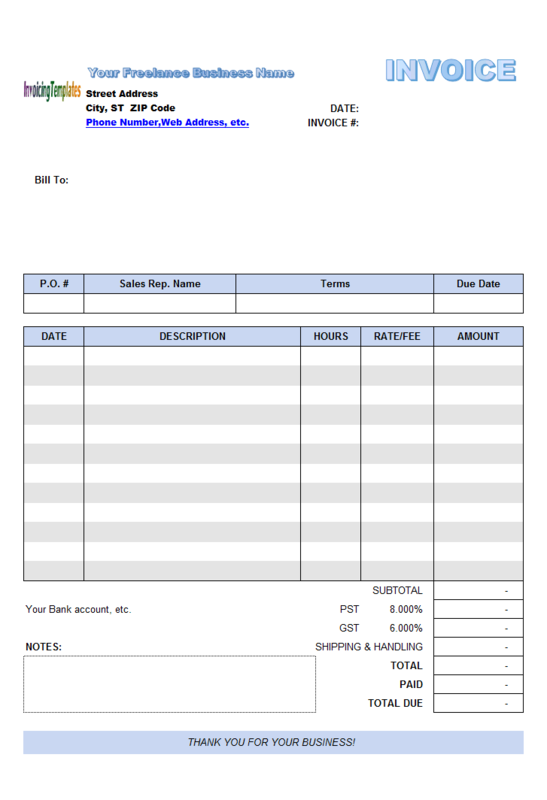 Once you finish you invoice, click "Save To DB" to save it to database. 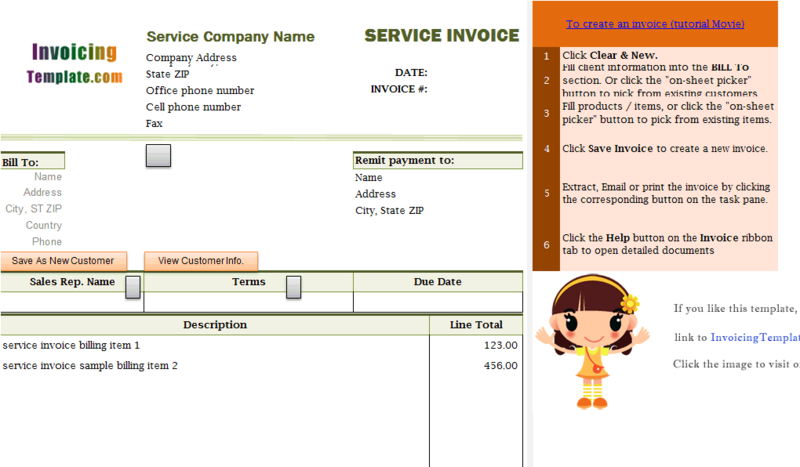 An invoice# is generated automatically. Generate the PDF file. 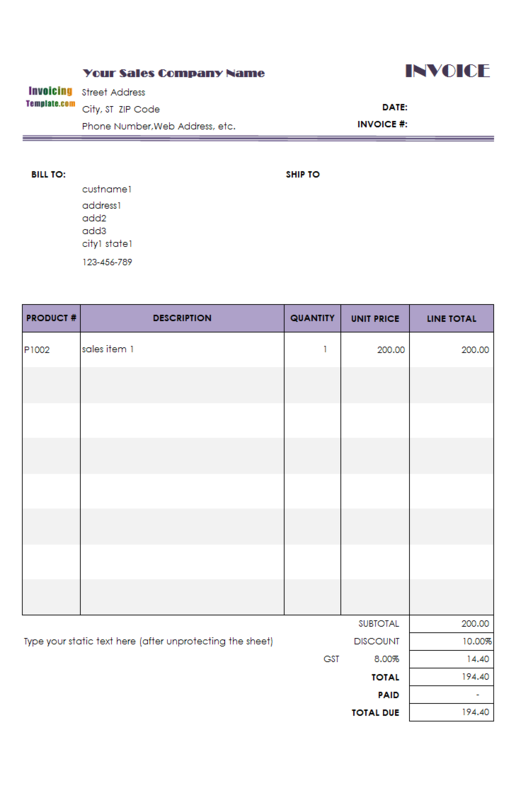 Make sure the name of the PDF file is same as the Invoice#. 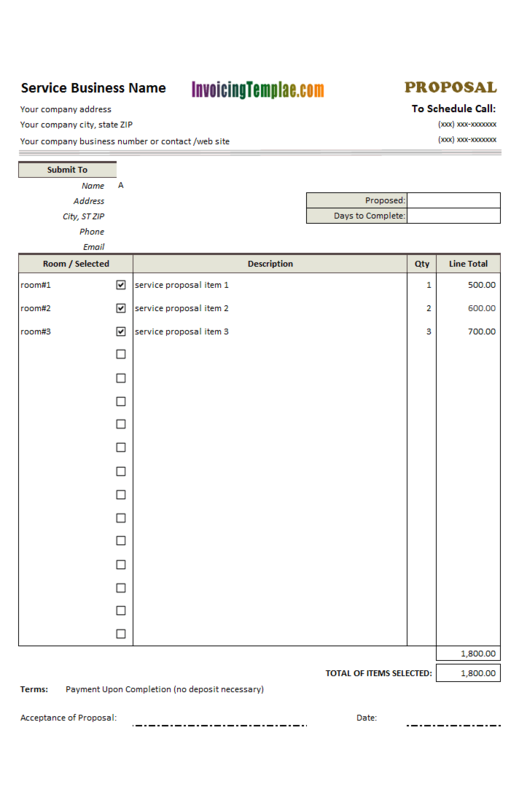 For example, if the current invoice is INV1051, your PDF file should be "INV1051.pdf". Click "Open PDF file" hyper link to open the pdf file. 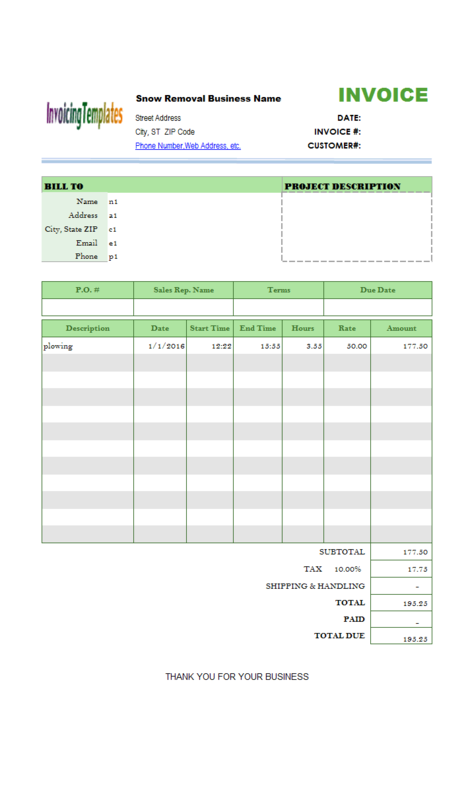 In this simple invoicing template sample for Microsoft Excel we demonstrates how to customize the previous sample c4066 so that it prints two 5.5 inch X 8.5 inch invoices on a single 8.5 inch X 11 inch paper. 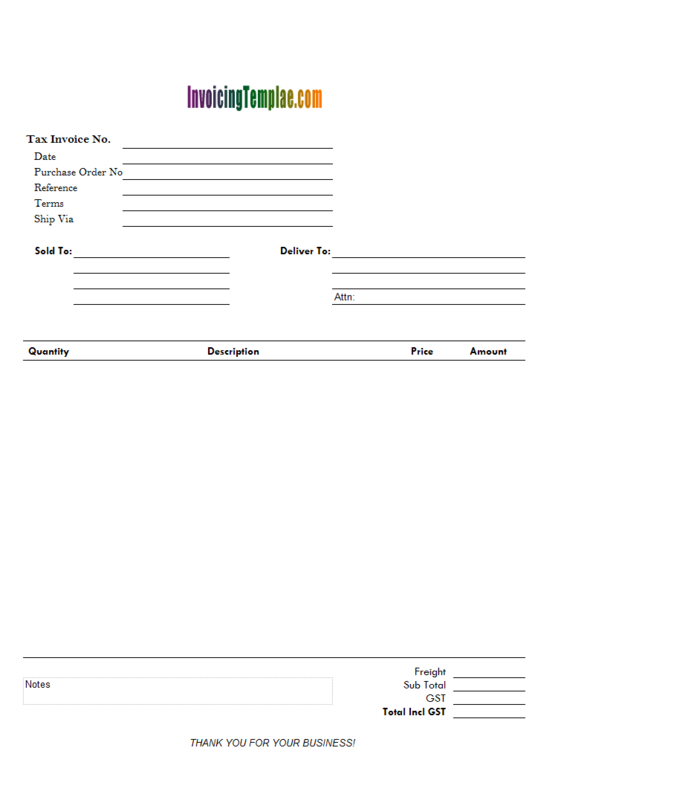 Music Store Invoicing Form (Wholesale) is a variant of Music Store Invoicing Form (Retail). 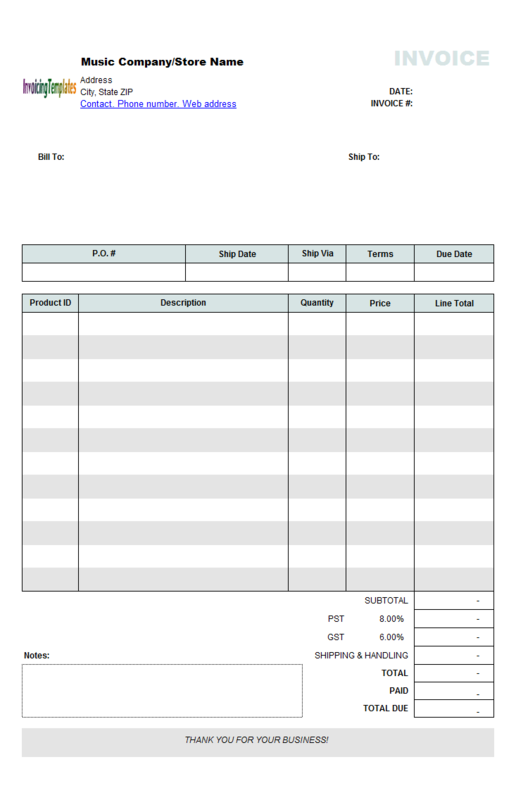 It differs from the original version in that this wholesale version includes a new custom field, Discount, on the bottom of the form, allowing you to apply discount to wholesale clients. 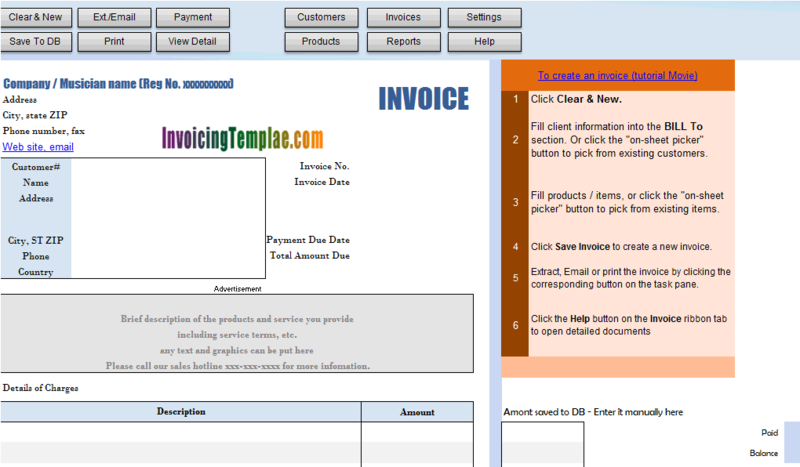 Many templates here on InvoicingTemplates.com has the "Email" field on the "Bill To" or "Client Info." section. By adding this to the billing form, new customer accounts created by clicking the "Save As New Customer" button (or the "Save New Customer" button on the task pane) could have the email address saved too. Otherwise, you have to go to the "Customer Edit" or "New Customer" window to set the email address for customers. 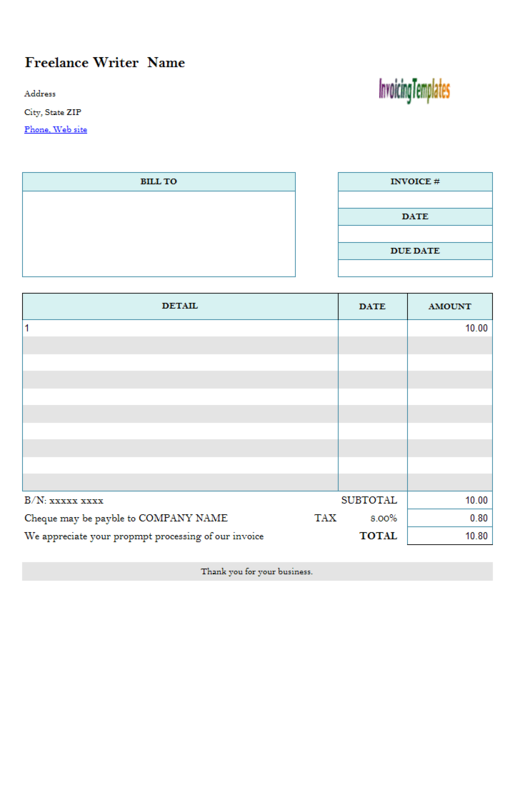 The original consulting invoice template in the Consulting category contains a "Machine#" field. This sample demonstrates how to remove it. 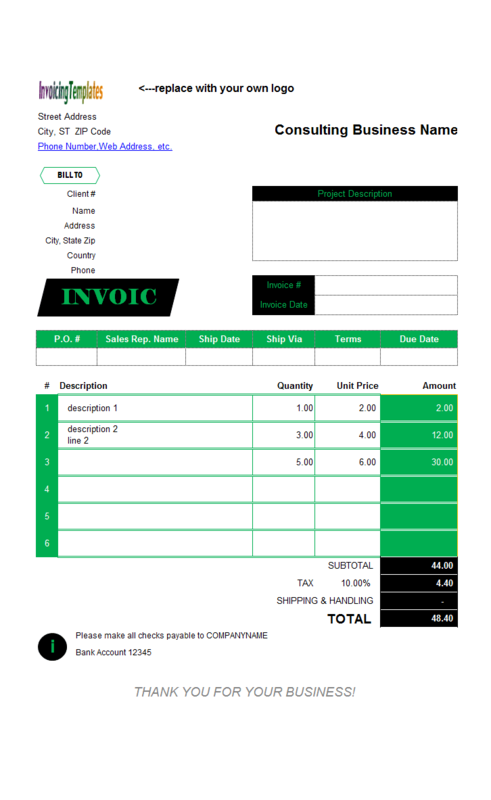 By moving the "Machine#" field out of the printable invoice form, the original Consulting Invoicing Template becomes more universal and thus be suitable for more types of constants. 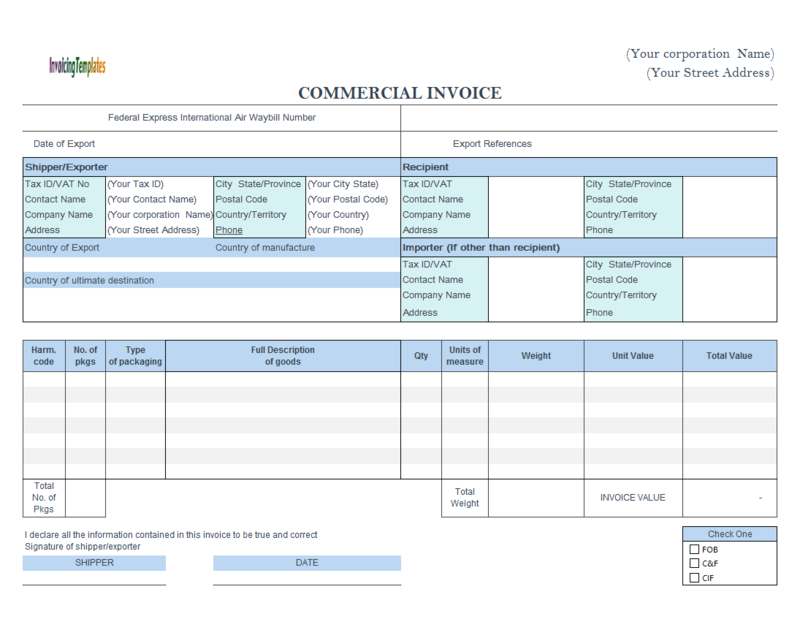 The sample consulting invoice template created in this tutorial, like all the other templates here on InvoicingTemplate.com, has a free edition and an edition that should be used with Invoice Manager for Excel (namely Uniform Invoice Software).